Since moving Maxwell has spent a lot of time in the garden. He loves playing in the garden and he can end up spending hours out there. A few months ago Maxwell was sent a YBIKE to review. For a few months now we have been reviewing it and so far we have been very impressed by it. The YBIKE arrived quickly and was well packaged. The YBIKE came in a single box which wasn't large. Upon opening I was impressed to see that the bike needed minimal work to get it looking like a bike and there were only a few bits to fit together. The assembly of it was extremely easy thanks to the easy to read instructions. The instructions included diagrams and I found that the bike took minutes to put together which is brilliant when you have a eager toddler wanting to get on it. Once up, I was impressed with the way that the bike looked. It was a bike which would stand out from the crowd. Coming in a orange and black colour it was very eye catching. Substantial improvements in both static and dynamic balance. Substantial improvements in bilateral coordination. I was also impressed to see that the bike would help Maxwell's confidence when riding a bike and would also improve his physical activity. 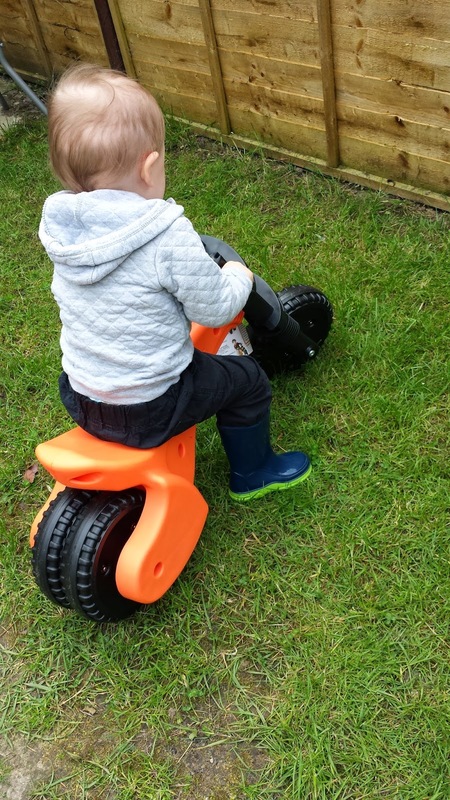 At first Maxwell's was very wobbly on the bike, hated sitting down on it and was also very cautious when using it however over recent weeks Maxwell's confidence on the bike has improved and now Maxwell likes to slowly go up and down the path in our garden on it. Everytime I see Maxwell use the YBIKE I see some sort of improvement. The bike has some brilliant features. I love the fact that the bike is light weight, if we want to take it to the local park we can. It is not heavy so is easy enough to carry back to our house if Maxwell gets fed up of playing on it. The bike is also small enough to transport in the car so has been taken over to A.Rachels for Maxwell to play on. The bike is also made of plastic which makes it easy to clean which I feel is important when children are outside. You never know what they may pick up on there hands. 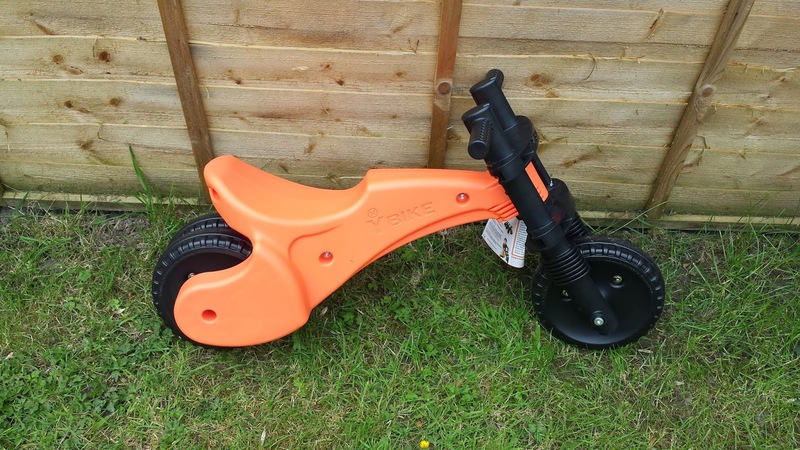 The YBIKE is recommended for children aged 2-4 however I am hoping Maxwell will get a little more use out of it after he is 4 as it really is a clever product. Something which astonishes me with this product is the fact that it comes with a 2 year warranty. This just shows me that the bike is built to last and that the makers are extremely confident that nothing will go wrong with it. Priced at just £49.99 I think this bike would be a huge hit for your little one this summer. If you were unimpressed with the orange bike we were sent, you will be pleased to learn that the bike also comes in green, blue and pink. If you would like to purchase an original YBIKE please click here. However we did receive the product for review purposes. Everything written in this post is my own honest opinion. This bike looks so sturdy and nice. Your little one is really enjoying it. I really like the look of these. I would love the get one for my daughter soon so she can join in with her big brother! Oh this sounds like a really good idea! We've been thinking of getting our toddler a bike as he loves seeing ours and I know his balance is pretty good as he uses scooters at toddler group and nursery. 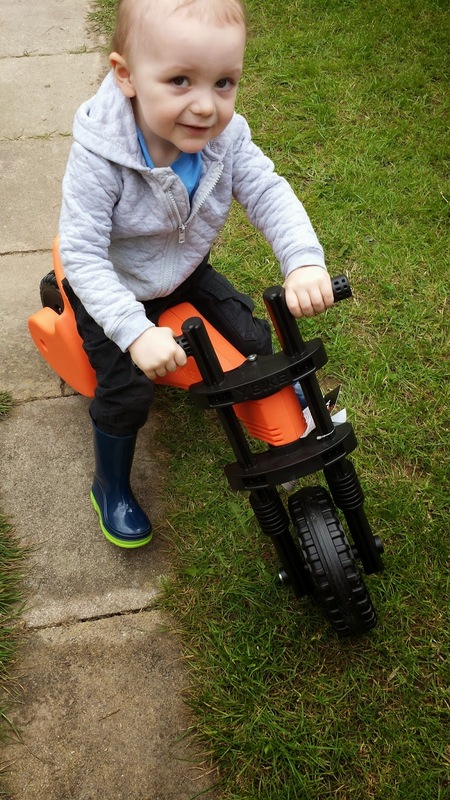 He's pretty tall for his age though and will be 3 in September so I may have to do a bit more investigating as to whether a YBIKE would really last him long enough but it still seems like a great product! I like the style, sort of looks like a motorbike, very cool! My 2 year old is still very wobbly on his balance bike, but i see some little ones whizz ing about on them! My older two love their bikes, and I'm hoping my toddler will be as much of a fan. I've not heard of this range - will look into it. I love these bikes, I think they're a great learning tool for when they're ready for a bigger bike. Looks fab! My son had a balance bike and it really helped develop his sense of balance. It was also easy to transfer to a bike when he was old enough. I really wanted a balance bike for 6yo when she was younger, but never got one. We love balance bikes. Just makes the transition to a normal bike so easy. I'm glad that he is improving and gaining confidence on his balance bike. I wish I'd have got one for my son when he was younger. Awww he looks a little cutie on that. These are great, my son has a similar one and he loves it. It is great for teaching them balance before confusing them with peddling too! Looks a great way to start on bikes. Looks a solid starter bike, great to learn on! Like the two wheels at the back. I think it's a bit pricey but I'm sure your child gets good use out of it. Such a cute little bike! Never heard of this particular bike before, but I would consider getting one for my son this Christmas.